System windows such as File Explorer, Windows Explorer, dialog boxes and Control Panel in Windows Vista and Windows 7 has a large and huge border around it, which is shown as transparent in Windows Aero Glass interface. The transparency effect is nice user interface, but you may like the windows’ border to be larger, or smaller and slimmer. 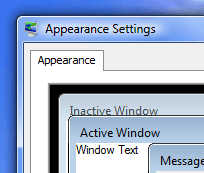 It’s possible to configure Windows Vista or Windows 7 settings to make the transparent borders larger or smaller. Default border size of windows in Windows Vista and Windows 7. On the pop-up right click context menu, select Personalize. Then, click on Windows Color and Appearance in Windows Vista or Windows Color in Windows 7. Click on Open Classic Appearance Properties (Windows Vista only) for more display and color options. 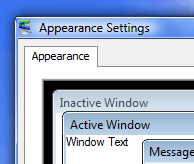 Make sure the color scheme selected is of Windows Aero, then click on the Advanced button in Windows Vista or Advanced appearance settings in Windows 7. Select Border Padding in the Item drop-down box. Type or select a new Size for the border to change (increase or decrease) the size of the border. Default border size is 4. Click OK twice to save the changes and exit. The new visual border size for Windows Aero will display immediately.